This vishvavajra comprises two crossed five-pronged vajra. 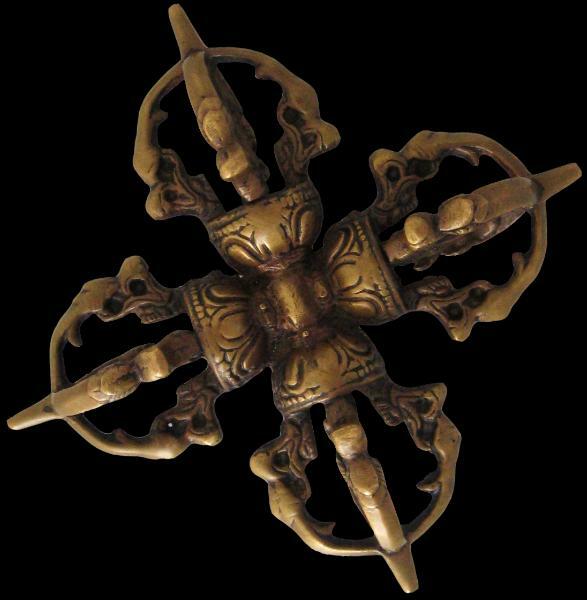 Each prong is emitted from the mouth of a stylised makara, which in turn emerge from a base cast with eight lotus petals. The vishvavajra has considerable tantric wear and a rich, smooth chocolate patina. vishvavajra represents the principle of absolute stability, characterised by the solidity of the element earth. The raised wooden throne on which the Dalai Lamas sat usually was decorated with a central vishvavajra. vishvavajra such as the example here symbolise the purification of the ‘twenty deluded views’ of the five aggregates, conceived as a group of four self misconceptions, according to Beer (2004). The vajra is an important symbol in Mahayana Buddhism. Originally, the thunderbolt was a weapon of Indra from Indian Hindu legend. Indra became incorporated into Tibetan Buddhist lore as a disciple of the Buddha, and was transformed into the bodhisattva Vajrapani. 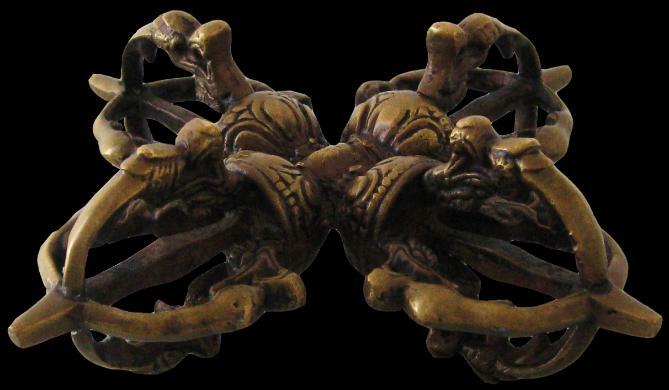 The vajra emerged as the strongest weapon in the universe and became a symbol of universal compassion of enlightened beings.